Today’s Meet the Roaster, Bristol’s Extract Coffee Roasters, is one of the first roasters I became aware of when I started the Coffee Spot. It’s also one of the first, after Rave and Clifton, to invite me to visit the roastery, so it’s rather embarrassing that it’s taken me until now to accept the invitation! My host for the day was Callum, a relatively new recruit to Extract, but I was lucky enough to meet Dave, who along with his sister and best friend, established Extract in 2007. For a while, Extract was synonymous in my head with the Boston Tea Party, the Bristol-based, regional chain, which is still a major Extract customer. However, it’s so much more than that, with a national presence. These days, it roasts around 13 tons of coffee a month (a far cry from its original 5kg roaster), with 80% of the output as espresso blends. 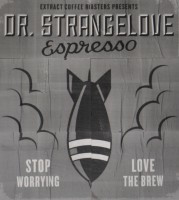 The remaining 20% includes single-origin espressos with iconic names such as Dr Strangelove and Strongman, Extract’s Movember single-origin, which is only on sale in November, a £1 donation made to charity for each kg sold. There are also single-origin filters and filter blends which are steadily increasing in popularity. Most roasters I know are, first-and-foremost, coffee nuts. It’s to be expected. While they select their equipment with care, a roaster is, for most, a tool. Not so, I feel, with Extract. Not that they aren’t coffee nuts too, but I’ve not met anyone as in-tune with the actually machinery of roasting. With the exception of James, the 5kg Ozturk roaster which Dave bought brand new in 2007, along with six sacks of green beans, to get Extract going, all Extract’s roasters are second-hand. They’re all extensively refurbished and modified too, Dave being a very-hands on mechanic. And yes, they all have names. I also sense a certain attachment. Plenty of roasters start with a small capacity machine, then, as business grows, they buy a larger roaster, selling the old one to fund the growth. Not so, Extract. James, for example, is still around, roasting single-origins and other small lines. However, nowhere is this sense of attachment stronger than with Betty, a 1955, 60kg Probat which Dave bought in 2009 from a company in Wales as Extract’s second roaster (quite a jump from 5kg!). For the last six years, she’s been the backbone and the face of Extract. However, the grand old lady’s going into semi-retirement soon with the acquisition of the spritely young Bertha, a 1997, 120kg Probat (technically, still a teenager). Bertha arrived from Bosnia the week before Christmas to take over from Betty as the main production roaster. Another company might sell (or, heaven forbid, scrap!) Betty, but I suspect that she’ll be around for as long as Dave’s in charge. Following (another) refurbishment, Betty will be putting her feet up in her old age, swinging into action just once a week. Bertha, like the other roasters, is fully manual, although given her size, it’s a two-person job. Another of Dave’s reclamation/refurbishment projects, Bertha’s been fitting with an afterburner and is a 0% emissions roaster. As much as he loves his roasters, it’s not all about the kit. Dave insists that they’re secondary, as is the entire roasting process. Having big roasters simply gives Extract economy of scale, reducing the time spent roasting, freeing it up for other things, such as cupping and selecting the best green beans, which, Dave told me, is the key. Everything else flows from that. At the other end of the business, time can be spent on training and supporting customers, another of Extract’s vital roles. This is where the likes of my guide, Callum, comes in. Callum quit his job as a recruitment consultant to join Extract and, like all new recruits, he started by packing coffee. These days, he’s an account manager for the South West as well as a mean barista (everyone at Extract has to walk-the-walk as well as talk-the-talk, and they’re all top baristas). Callum made me an espresso using a washed Kenyan Kiamabara. A really bright coffee, it was too much for me on its own, but in milk it was incredibly smooth. Had I not seen Callum use the same grinder, I’d have sworn it was a different coffee. I departed with a massive box, packed with Extract’s Finca Las Flores Mexican decaf, the seasonal Dr Strangelove single-origin espresso (currently a washed Colombian) and an Ethiopian Konga natural espresso, all of which have been amazing. December 2016: Extract Coffee Roasters was a runner-up for the 2016 Best Roaster/Retailer Award. If you enjoyed this Coffee Spot, check out the rest of Bristol’s speciality coffee scene with the Coffee Spot Guide to Bristol. This entry was posted in Bristol, Meet The Roaster and tagged include by Brian Williams. Bookmark the permalink.